Foreign aid refers to the transfer of resources to developing countries to assist with economic growth and national development. A component of this is official development aid (ODA), which aid provided by official agencies with the intent of advancing economic development in developing countries. The United States has been a significant benefactor, with foreign aid existing on numerous levels: individual, corporate, and government. At the government level, United States Agency for International Development (USAID) provides broad assistance to developing countries on behalf of the government. China is also catching up: President Xi Jinping has recently introduced China’s new Belt and Road initiative, a trillion dollar plan to create economic and diplomatic ties with over sixty nations. On the surface, it appears that these forms of foreign aid have been effective, with considerable advancements in terms of food security, global health, poverty, education, and democratization. However, these developments have disguised the long-term insidious consequences that foreign aid has perpetuated. Before analyzing the impact of foreign aid, it is essential to first investigate the motives behind giving aid. Despite claims of having a moral imperative to assist others, ulterior motives are ingrained within these policies. Remnants of the Cold War era, where nations competed to expand their respective spheres of influence, have carried over to contemporary politics. ODA does not subsidize citizens of developing countries but rather subsidizes foreign governments. Structuring foreign aid in this manner is reminiscent of the trickle-down theory, which has been proven to be ineffective. Trickle down economics postulates that if the members in upper-income brackets have their wealth increased, those in lower income brackets will eventually also benefit. Parallels can be drawn to the structure of foreign aid in that aid is granted to governments to invest in infrastructure and resources and is expected to trickle down to its citizens. On May 15, 2005, citizens of Ethiopia took part in a rigged democratic election where the Ethiopian People's Revolutionary Democratic Front (EPRDF) unseated the Derg, a militant Marxist authoritarian regime. Ethiopia has received a net of $3 billion USD in ODA annually. A study from the Human Rights Watch organization revealed that the EPRDF has used foreign aid as a tool for political control and oppression, denying dissidents access to agricultural development resources such as land, seeds, and aid. Furthermore, foreign aid creates both economic and political dependency that are applicable irrespective of local governments. Sustained and continuous aid accounts for approximately half of the Ethiopian government’s national budget. 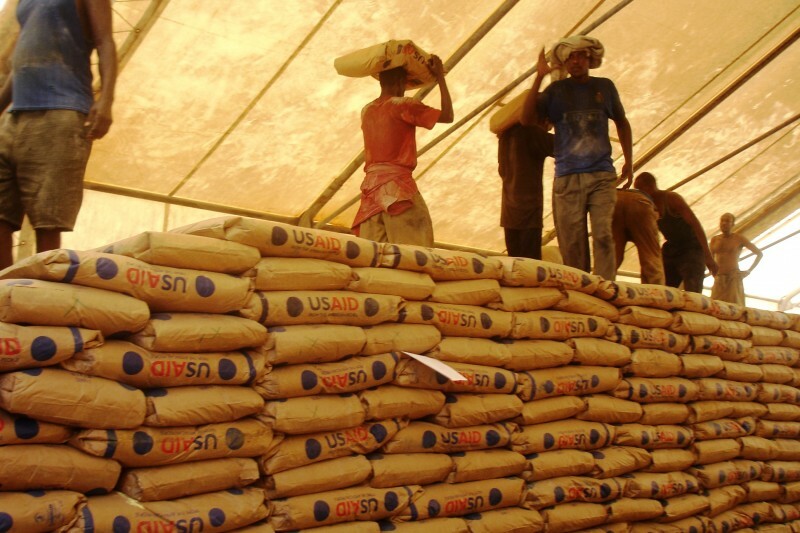 Consequently, aid has become a facet of the nation’s long-term plans economic development and are viewed as a part of the nation’s annual income. In a similar vein, foreign aid also creates power dynamics between benefactors and recipients that results in political dependency. Given that foreign economic aid is not given altruistically, there are also strings attached. Local governments often face the dilemma of balancing national economic development with satisfying donors. When Ethiopia transitioned into a democratic political model, G8 countries proposed doubling foreign aid. Conversely, the World Bank also suspended direct foreign aid support and would “reduce aid over time if governance does not improve”. This is a compelling incentive, but attempts to balance national development with appeasing donors leads to tradeoffs where the quality of governance is reduced due to competing and conflicting goals. Power imbalances can also be seen in terms of the benefactor-recipient dynamic. China’s Belt and Road Initiative has led to infrastructure investment programs and an expanded presence in nations such as Kenya. Consequently, many Kenyans report experiencing racism and discrimination with reported incidents of segregated washrooms and derogatory language. Unlike the United States, China acknowledges that their primary incentive for granting foreign aid is reaping the economic benefits of increased connections and trade rather than altruistic intentions. In fact, this economic incentive has motivated China to the extent where their Belt and Road initiative has been accused of being a debt trap, as illustrated by their acquirement of a Sri Lankan port after Sri Lanka failed to pay its debt. As a result, China’s Belt and Road Initiative fails to take advantage of the opportunity for intercultural interactions and understanding, but instead maintains ignorance and segregation. As well, there is even a potential harm for recipient countries who may find themselves in a debt trap and have to give up resources in order to pay off their debt. This is not a case against foreign aid, but rather a case for rethinking how foreign aid is granted and how it aligns with humanitarian aid goals. Instead of the status quo where nations are concerned more with clout than assisting with organic and sustainable development, foreign aid should be aligned with the United Nations’ sustainable development goals (SDGs): eliminating poverty and hunger; providing quality education, healthcare, clean water, and affordable clean energy; promoting gender equality and peace; growing industries, infrastructure and the economy; reducing inequality; and mitigating climate change by creating sustainable land and water resource extraction practices. These goals have been connected with sustainable and organic national economic development, rather than resource extraction and infrastructure, which has been the focus of modern development. Another important component is effective altruism, a school of thought that promotes implementing utilitarian cost-benefit analyses to aid in order to determine the best allocation of resources that maximizes total welfare. Instead of giving freely and following the status quo, foreign aid should be granted based on where it would have the most effective and have the largest impact. Thus, the impact of every dollar is maximized so that it does the greatest good possible. Despite the controversies and shortcomings of effective altruism, its general guiding principle should be followed: foreign aid should be granted intentionally so that it focuses on a bottom-up structure where the lives of citizens in developing countries are improved and there is access to basic goods. Granting foreign aid to build access would be the most effective means of altruism given that the benefits would be immediate in comparison to, for example, the US granting foreign aid to foreign governments in order to promote democracy, which is arguably abstract, not immediately attainable and not an efficient use of resources.